Marina Bay Sands is an incorporated resort facing the Marina Bay. Marina Bay Sands is placed on 15.5 hectares of land with a total floor area of about 581,000 square metres. It officially opened on April 27, 2010. 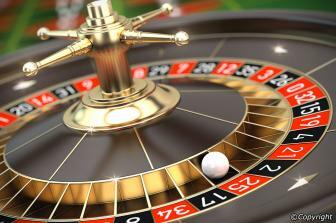 The resort has a hotel exhibition and convention amenities, theatres, entertainment facilities, restaurants and retail shops. The said hotel has three 55 storey towers that house around 2,561 suites and luxury rooms which is topped by the Sands SkyPark, a platform of sorts that gives guests and visitorsa 360 degree view of the country’s skyline. The park is a wide area that is home to gardens, restaurants and a 150 metre vanishing edge or “infinity” pool. This architectural feat stands 200 metres tall and features a 12,000 square metre wide area. To aid the SkyPark endure the natural swaying motion of the towers that are caused by the tremendous forces of wind and gravity, the engineers placed four structural movement joints, placed under the swimming pools, that were specifically designed and made to counteract the forces aforementioned. Specifically designed jack legs were also made and installed for future changes in the settlement in the earth. The Marina Bays Sands also features the Marina Bay Sands Casino, the Sands Expo and Convention Centre and The Shoppes at Marina Bay Sands. These attractions are also connected to the hoteltowers. 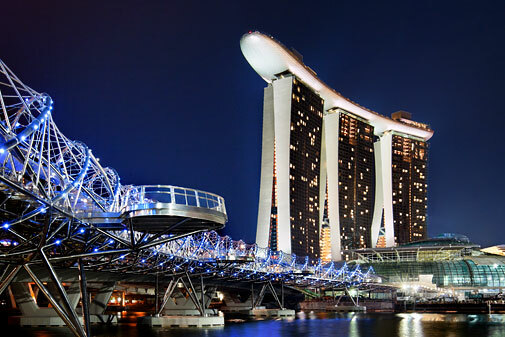 The Marina Bay Sands Casino is located near the Sands Expo and Convention Centre. 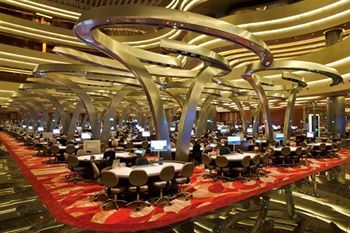 It extends to around 15,000 square metres over four levels of gambling, the casino features a total of 1,500 slot machines, 600 gaming tables and 2 noodle bars. Spanning about 1.3 million square feet (equivalent to 120,000 square meters) of meeting space, the Sands Expo and Convention Centre is the most flexible and is considered as one of the largest meeting paces in all of Asia. The centre is also considered as the biggest MICE (Meeting, Incentives, Conferences and Exhibitions) infrastructure in the country and has the biggest ballroom in Asia which is capable of accommodating around 11,000 guests. The Sands Expo and Convention Centre occupies five floors of convention and exhibition space and houses around 250 meeting rooms and 2000 exhibition booths. Another attraction that can be found in the resort is The Shoppes which is Singapore’s first high end luxury mall that houses boutiques that features expensive luxury products from well known brands. Other attractions include a canal, 1 housing renowned nightclubs, 2 Crystal Pavilions, indoor skating rink 2 theatres, the Event Plaza where individuals can enjoy the Wonder Full show every night, the ArtScience Museumand an ArtPath.